Microsoft Corporation recently published a report warning that there will not be enough American college graduates in computer science to fill all of the available job openings in computer-related occupations between now and 2020 (Microsoft 2012). Microsoft uses Bureau of Labor Statistics projections to claim that from 2010 to 2020 there will be an additional “1.2 million job openings in computing professions that require at least a bachelor’s degree” (Microsoft 2012, 6). Microsoft warns that since only about 40,000 Americans graduate with a bachelor’s degree in computer science each year, many of the 120,000 projected job openings in computing occupations each year will go unfilled. As further evidence to support its claim of present and future labor shortages in computer-related occupations, Microsoft points to the 6,000 job openings at the company, 3,400 of which are for “researchers, developers and engineers” (Microsoft 2012, 3). As part of its analysis, the Microsoft report asserts that the U.S. educational system is failing to produce enough graduates in the broader science, technology, engineering, and math disciplines (also known as the STEM fields). It recommends that Congress address the alleged shortage of STEM workers between now and 2020 in part by making 20,000 new H-1B temporary “nonimmigrant” guest worker visas available each year for employers that hire foreign graduates with degrees in STEM fields from U.S. universities. In addition, the report suggests that Congress recapture unused permanent immigrant visas (“green cards”) and make 20,000 of them available annually over the next 10 years to foreign graduates in STEM fields. Microsoft claims that the federal government could raise $5 billion over a decade if it charges employers $10,000 for every new STEM H-1B visa and $15,000 for each STEM green card. These funds would then be redistributed to states “where STEM education investments are needed” (Microsoft 2012, 5). The report also calls for strengthening the U.S. pipeline for educating and training STEM workers by: “1) strengthening K–12 STEM education, 2) broadening access to computer science in high schools, 3) increasing STEM capacity in higher education, with a special focus on computer science, and 4) helping more students obtain post-secondary credentials and degrees by addressing the college completion crisis” (Microsoft 2012, 10). The Microsoft report projects a labor shortage over the next eight years by incorrectly assuming that only individuals with a bachelor’s degree in computer science can fill jobs in computer-related occupations. 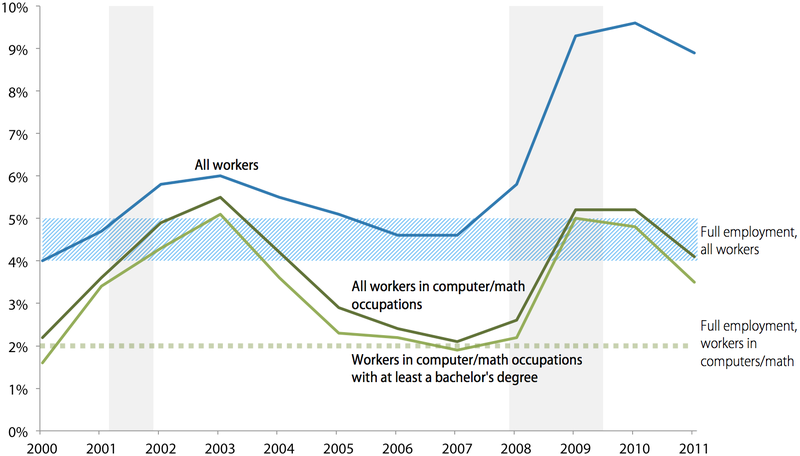 Data analyzed for this memorandum as well as other studies show that less than one-fourth to less than one-half of workers in computing occupations have a computer science degree. The report and Microsoft officials say a labor shortage already exists in computer-related occupations, citing as evidence the fact that the present unemployment rate of workers in those occupations (3.4 percent) is less than the 4 percent unemployment rate that prevails when the national economy is at full employment (generally understood as a 4 to 5 percent unemployment rate). But Microsoft is misleading when it uses the 4 percent full-employment unemployment rate for all workers as the point of reference. Data analyses suggest that for workers in computer-related occupations—and especially for those who hold a college degree (i.e., the workers Microsoft claims there is a shortage of)—the actual full-employment unemployment rate is closer to 2 percent. Further evidence that there is no shortage of workers in computer-related occupations is apparent in wage trend data. For example, from 2000 to 2011, the average hourly wage for workers possessing at least a bachelor’s degree in computer and math occupations rose less than half a percent per year, compared with the sharp wage increases we would see if a labor shortage existed in these occupations. Granting Microsoft’s request to increase the supply of STEM workers and workers in computing occupations with college degrees through additional H-1B visas and STEM green cards would propel unemployment rates in these occupations even higher, absent substantial new job creation. This is because unemployment rates for these workers are approximately double where they would stand if these labor markets were at full employment. These higher unemployment rates will keep wages from rising, which may be a desirable outcome for Microsoft but not for workers or the U.S. economy. Contrary to its report and public statements, Microsoft (and other employers in STEM fields) already have plenty of avenues to hire and retain new foreign graduates to work in STEM occupations. Recent research suggesting that the most highly educated graduates in STEM fields are in fact remaining in the United States for the long term supports this conclusion. Keeping the best and brightest foreign STEM workers in the United States to fill labor shortages in STEM occupations should be a national priority, but recent data show that no significant labor shortages exist, and suggest that an adequate number of foreign graduates in STEM fields are already remaining in the United States to fill the limited job openings available in the stagnating U.S. labor market. The first significant problem with Microsoft’s report is the assumption that job openings “in computing” not filled by college graduates with computer science (CS) degrees will go unfilled. It is a well-known fact that computer science graduates are not the only source of new hires in computing. In the late 1990s, the Department of Commerce (DOC) published a report warning of looming labor shortages in the information technology (IT) sector, citing the lack of college graduates with CS degrees as a principal reason (DOC 1997). The Government Accounting Office (GAO)1 later published a report chastising the DOC for its faulty methodologies, noting that “IT workers come from a variety of educational backgrounds and have a variety of educational credentials such as master’s degrees, associate degrees, or special certifications” (GAO 1998, 8). National Science Foundation (NSF) data at the time indicated that “only about 25 percent of those employed in computer and information science jobs in 1993 actually had degrees in computer and information science” (GAO 1998, 5). The same is true in the main computer-related occupations, according to the most recent comparable NSF data, presented in Table 1. 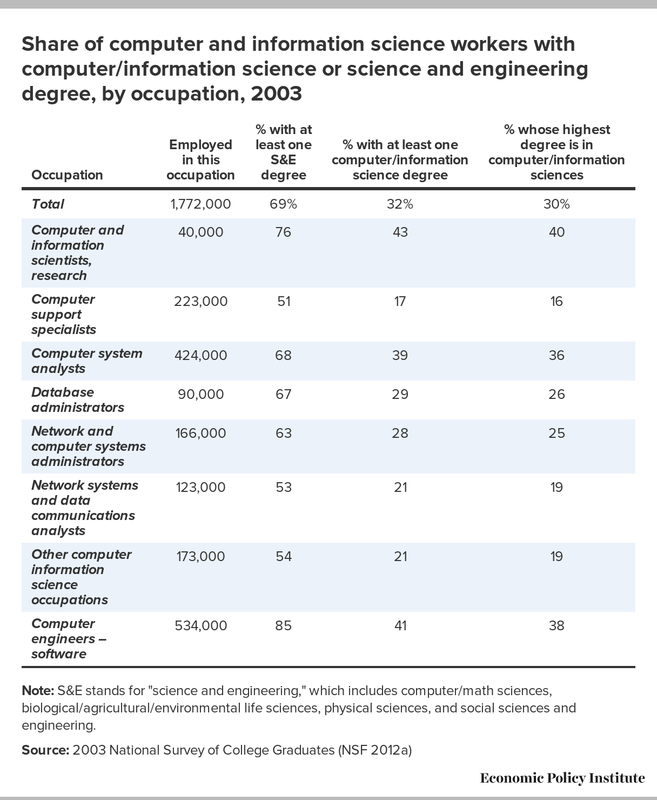 As the table shows, even in the occupation where one would most expect workers to hold a CS degree—computer and information science researchers—only 43 percent (approximately two out of every five) hold a CS degree. A similar percentage (41 percent) of computer software engineers have CS degrees, as do computer system analysts (39 percent); and 17 percent to 29 percent of workers in the remaining listed computer-related occupations earned a CS degree. Professor Norman Matloff of the University of California, Davis, recently conducted a similar analysis of data from the NSF’s National Survey of College Graduates, which showed that “only 40.2% of those with Software Engineer, Programmer or Computer Scientist titles came to the profession from a CS degree” (Matloff 2012, 5). It is important to note that neither of these data sets includes workers with less than a bachelor’s-level education; as Matloff mentions in his paper, many titans of the tech world, including Bill Gates, Larry Ellison, and Mark Zuckerberg, do not have a college degree in any field. Note: S&E stands for "science and engineering," which includes computer/math sciences, biological/agricultural/environmental life sciences, physical sciences, and social sciences and engineering. Current data from the Occupational Information Network database tell a similar story, further highlighting the flawed nature of the Microsoft report’s assumption that everyone in the computing professions has or needs a university-level CS degree. For example, 47 percent of web developers do not have a four-year college degree (O*NET 2012a), let alone a degree in CS, and 41 percent of computer systems analysts do not have a four-year college degree (O*NET 2012b). Thus, calculating the number of students graduating with a bachelor’s degree in CS each year is not a methodologically credible way to measure the future supply of potential workers in these occupations, and it is illogical for Microsoft to hinge its claim of a labor shortage on this single statistic. Workers in computer-related occupations come from a variety of educational backgrounds, and always have. A 2007 study by professors Lindsay Lowell of Georgetown University and Hal Salzman of Rutgers University that assessed the adequacy of America’s STEM education pipeline and the perceived labor market shortages of scientists and engineers contradicts Microsoft’s main conclusions. Anyone interested in the subject will find the entire report valuable, but two points made by Lowell and Salzman are particularly relevant. They find that there is a sufficient supply of students well-prepared to enter the fields of science and engineering, arguing that “the available evidence indicates an ample supply of students whose preparation and performance has been increasing over the past decades” (Lowell and Salzman 2007, 40). They add that there is also an adequate supply of experienced STEM workers, writing, “Purported labor market shortages for scientists and engineers are anecdotal and also not supported by the available evidence” (Lowell and Salzman 2007, 43). Keep in mind that this analysis was conducted just before the recession that began in December 2007. Since then, the number of STEM degrees awarded to U.S. citizens and legal permanent residents has remained relatively constant, increasing slightly (NSF 2012b), while unemployment rates for all workers with a bachelor’s degree or higher—including those in computer-related occupations and in STEM fields overall—have increased, and remain stubbornly high compared with their unemployment rates before the Great Recession. This is misleading. Microsoft and Mr. Smith claim a labor shortage exists in computer-related occupations and hence call for an increase in foreign workers educated at U.S. universities with at least a bachelor’s degree. But to establish the claim, they cite the unemployment rate during periods of full employment for the entire national economy, not for engineers, scientists, or college-educated workers in computer occupations. The full-employment unemployment rate for all college-educated workers is not 4 percent—nor is it 4 percent for computer-related occupations. Figure A shows that since 1992, whenever the national unemployment rate of all workers has been in the 4–5 percent range (i.e., at or near full employment), the unemployment rate of college graduates has never been higher than 2.3 percent (which it reached in 2001). Over the past 20 years, including in recessionary periods, the unemployment rate of college graduates has averaged 2.7 percent. 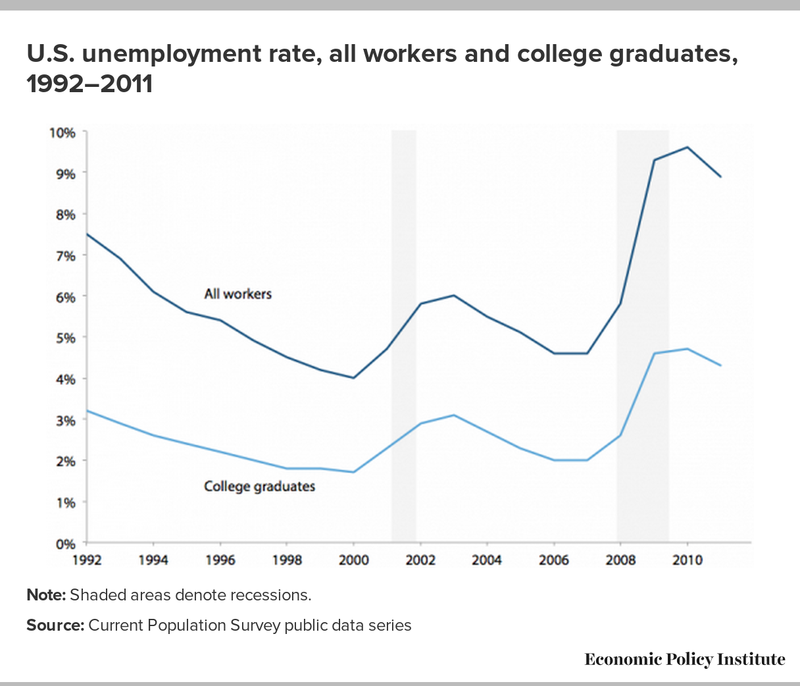 Thus, the unemployment rate of college graduates when the national economy is at full employment is closer to 2 percent. Furthermore, Microsoft’s claim that a 4 percent unemployment rate equates to full employment of workers in computer and mathematical occupations is also misleading. Figure B shows the relevant unemployment data for computer and mathematical occupations,3 the occupational category on which Smith and Microsoft focus most of their analysis, and which they sometimes refer to as “computer-related occupations.” For comparison, the national unemployment rate of all workers is included. Note: Top horizontal shaded bar shows that the unemployment rate of all workers at cyclical peak (full employment) ranges from 4 percent to 5 percent. Bottom horizontal dotted line shows that the unemployment rate for workers in computer and mathematical occupations at cyclical peak is around 2 percent. Vertical shaded bars denote recessions. The data in Figure B paint a picture similar to that presented in Figure A. Although the unemployment rate is lower in computer occupations than in the labor market overall, changes in the unemployment rate of workers in computer occupations have generally tracked fluctuations in the national unemployment rate. Since the end of the recession that ended in November 2001, whenever the national economy has been at full employment (with an unemployment rate between 4 and 5 percent), the unemployment rate of workers in computer occupations has not surpassed 2.4 percent; for college-educated workers in the occupation, it did not rise above 2.2 percent. Thus, what we consider full employment in these occupations is an unemployment rate much closer to 2 percent, rather than 4 percent as Microsoft claims, especially when it comes to college-educated workers. As Figure B shows, for all workers in computer occupations as well as for everyone else, elevated levels of joblessness have not yet fully subsided. 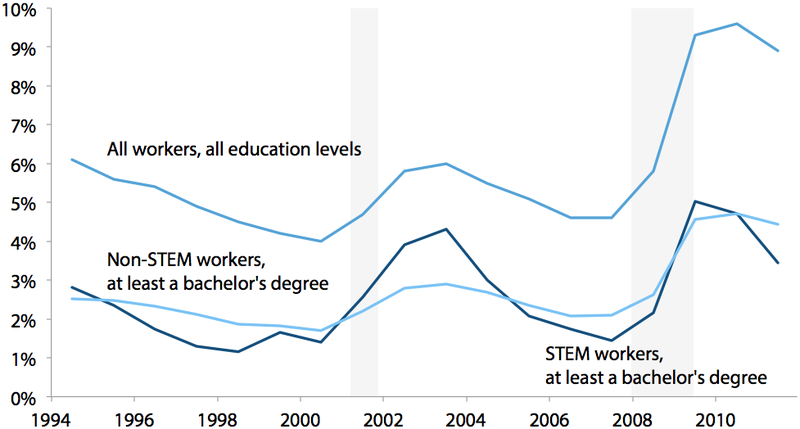 College-educated workers across the broader spectrum of STEM occupations have fared similarly. 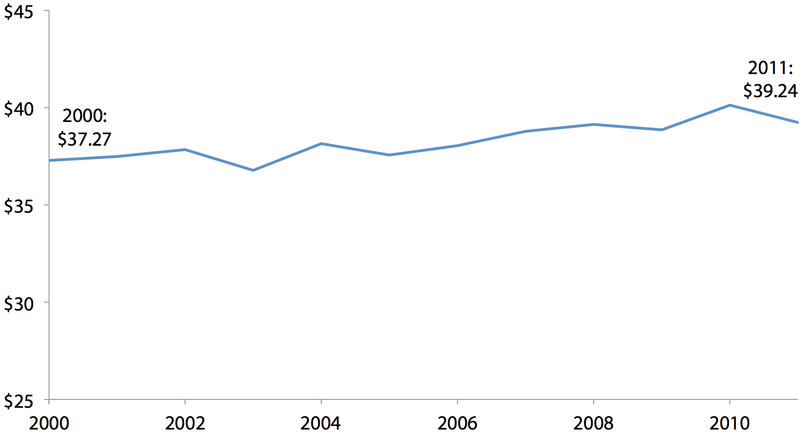 Figure C shows the unemployment rates of college-educated workers in all STEM and non-STEM occupations4 between 1994 and 2011. Note: Estimates are for the civilian labor force age 25 and older with a bachelor's degree or higher education. Shaded areas denote recessions. 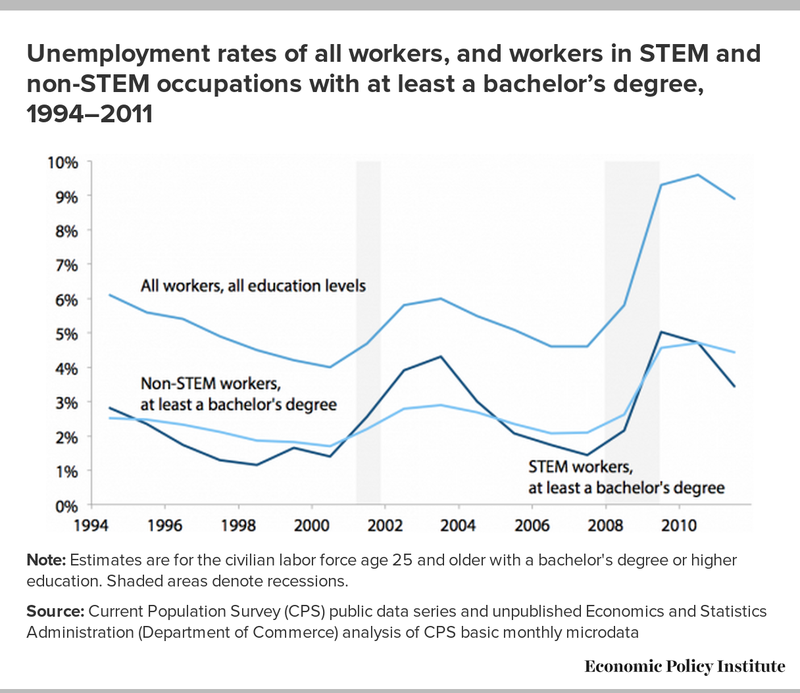 As the figure shows, when the entire economy has been at full employment (i.e., at an unemployment rate between 4 and 5 percent), the unemployment rate of college-educated workers in STEM fields ranged from 1.2 to 1.7 percent, except in 2001, as a recession was underway, when it reached 2.6 percent (the overall unemployment rate in 2001 was still 4.7 percent, but increasing rapidly). As of 2011, the unemployment rate of college-educated STEM workers was still 3.4 percent—more than double the 1.4 percent rate it stood at immediately preceding the recession that began in late 2007. This means that contrary to Microsoft’s claims, there are too many educated, experienced STEM workers who are trying to find a job; there is not a shortage of them. It is true that unemployment rates of workers in computer-related occupations, of all college-educated workers, and of college-educated workers in STEM and computer-related occupations have fluctuated with changes in business cycles, similarly to the way the national unemployment rate fluctuates. But, taken together, figures A, B, and C demonstrate these groups of workers have unemployment rates that are consistently lower than the national unemployment rate of all workers. They also lead to the reasonable conclusion that full employment for these workers is an unemployment rate at or near 2 percent. If there were a shortage of college-educated workers available to fill jobs in STEM and computer-related occupations, their unemployment rates would be expected to remain low when the overall unemployment rate climbs. That has not occurred—instead, the unemployment rates (and the resulting pool of educated, jobless workers) in STEM and computer-related occupations have increased at a rate similar to the national unemployment rate. And as with the national unemployment rate, they have yet to rebound to prerecession levels. Microsoft is proposing that the government increase the supply of STEM workers with college degrees even though their unemployment rate is already double the rate at which full employment occurs for such workers. Microsoft’s proposal is unsurprising, since adding workers to the STEM labor supply during times of high unemployment and insufficient job creation would propel STEM unemployment rates even higher, thereby preventing wages in these occupations from rising. If this occurs, more STEM workers would have little choice but to accept whatever terms and conditions are offered by employers. This wage suppression is already occurring in computer and mathematical occupations. 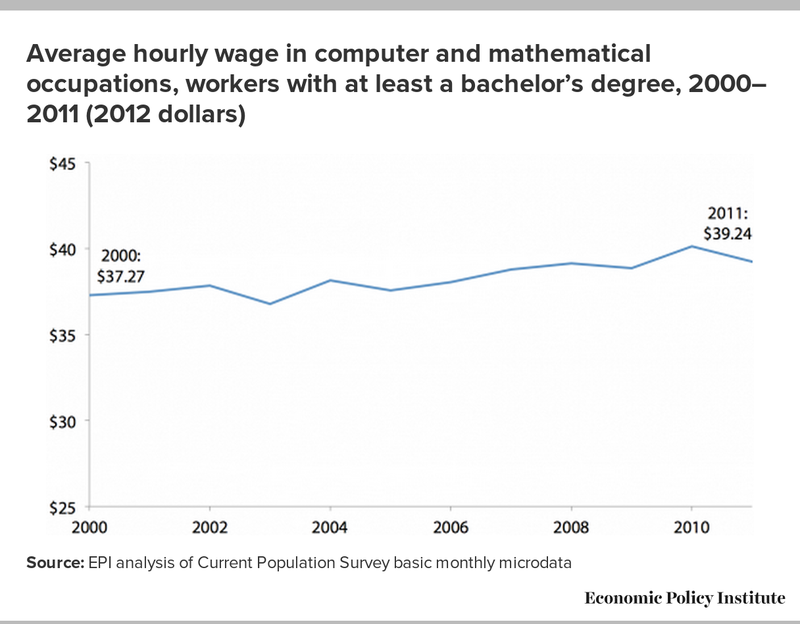 Figure D shows the average hourly wage for college-educated workers in computer and mathematical occupations over the last 11 years. The average hourly wage for college-educated workers in computer and math occupations rose 5.3 percent over 11 years, from $37.27 in 2000 to $39.24 in 2011 (in 2012 dollars), which translates to an average wage increase of less than half a percent per year. If a labor shortage existed in these occupations, one would expect wages to rise sharply as employers try to lure scarce workers to their firms. As Figure D shows, that has not occurred. Furthermore, Microsoft does not have any difficulty convincing job applicants to accept the terms and conditions of employment it offers. Despite wages for computer occupations having basically remained flat over the past decade, Fox Business reported last year that Microsoft has a 93 percent offer-acceptance rate (Willis 2011), meaning that almost every job offer Microsoft makes is accepted. Microsoft’s methodology for determining whether there is a shortage of workers in computer-related occupations looks solely at unemployment rates of workers in these occupations relative to what the overall unemployment rate would be if the entire economy were at full employment. Microsoft concluded that since the unemployment rate for workers in computer-related occupations (3.4 percent) was lower than the overall unemployment rate under full employment (which they set at 4 percent), shortages exist. But Microsoft used the unemployment rate for all workers under full employment as its point of comparison, rather than the much lower roughly 2 percent full-employment unemployment rate for workers in computer-related occupations, as well as for college-educated workers in computer-related occupations—i.e., the specific group of workers Microsoft claims there is a shortage of. Using the correct measurement of full employment in computer-related occupations leads to the conclusion that no labor shortages exist in these occupations. 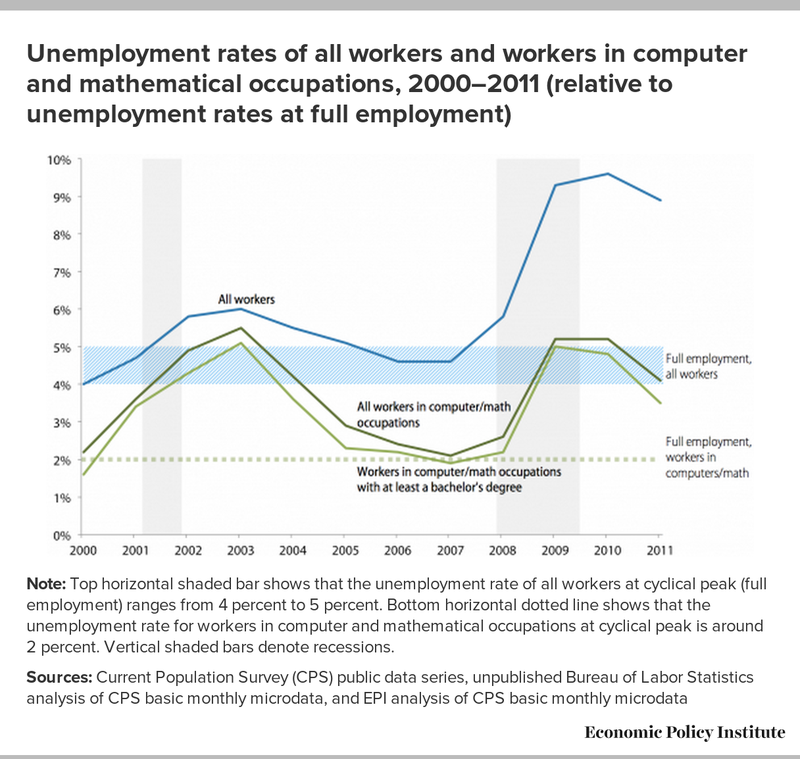 The unemployment rate for computer-related occupations still remains much higher than it would be under full unemployment, and is far from receding to its prerecession level. Microsoft’s assumption that only 40,000 CS grads per year will result in tens of thousands of computer-related jobs going unfilled is contradicted by all the basic, publicly available data. Once the unemployment rate for college-educated workers in computer-related occupations begins to approach the true measure of full employment for the occupation, it will make sense to debate whether new STEM green cards should be created and if H-1B levels should increase. When the economy is operating near full employment, it might be sensible to adjust public policies to help employers secure additional workers to keep the economy growing at full speed, but even then it might be preferable to first allow wages to rise, sending a market signal to U.S. students to enter the STEM fields.7 Unfortunately, there are no indicators that this pace of growth will occur anytime soon. Until then, the nation would be better served if Microsoft filled its 3,400 job openings for “researchers, developers and engineers” by hiring and retraining some of the 141,000 unemployed workers in computer occupations who are actively looking for work around the country (BLS 2012a). —Daniel Costa is an attorney and immigration policy analyst. His areas of research include a wide range of labor migration issues, including the management of U.S. guest worker programs, both high- and less-skilled migration, and immigrant workers’ rights. Daniel’s analyses of these topics have appeared in numerous national and local media outlets. 1. In 2004, the agency’s name was changed; GAO is now the Government Accountability Office. 2. The 3.4 percent unemployment rate cited by Microsoft is for August 2012 (BLS 2012a). In September 2012, the unemployment rate for computer and mathematical occupations rose to 3.5 percent. 3. For more general data, information, and background on the “computer and mathematical occupations” occupational category, see BLS (2012b). 4. As broadly defined by the Economics and Statistics Administration in the U.S. Department of Commerce (Langdon et al. 2011, 8). 5. For example, see Garun (2012); Bort (2012); Associated Press (2012); and Liedtke (2012). 6. Finn’s research shows that in 2009, close to 62 percent of science and engineering doctorate recipients categorized as “temporary residents” (a proxy for foreign-born persons in the United States on temporary nonimmigrant visas) had remained in the United States 10 years after graduation (Finn 2012). 7. This is the type of question that EPI’s proposed independent, permanent Commission on Foreign Workers would assess (Marshall 2011, 196–203). Department of Commerce (DOC). 1997. America’s New Deficit: The Shortage of Information Technology Workers. Economics and Statistics Administration (ESA). 2012. Department of Commerce. Unpublished ESA data on the size of the STEM workforce calculated using merged outgoing rotation Current Population Survey public use microdata files, provided to EPI upon request. Marshall, Ray. 2011. Value-Added Immigration: Lessons for the United States from Canada, Australia, and the United Kingdom. Washington D.C.: Economic Policy Institute. National Science Foundation (NSF). 2012a. Unpublished tabulations of the 2003 National Survey of College Graduates provided to EPI by Dr. Nirmala Kannankutty, senior advisor, National Center for Science and Engineering Statistics at the National Science Foundation.